Our staff of skilled and trained carpenters, maintenance mechanics and porters will handle all your building and property maintenance needs. We understand urgency and we are dependable and reliable. Our 25+ years of association experience allow us to better service our customers and the properties they manage. We can tailor your contract on a “time and materials” basis or contract hours on a daily, weekly, monthly or yearly schedule. Rezkom offers 24/7 emergency services so you can rest assured we are there when you need us. This is especially important during natural disasters, severe weather or storm events, fires, flooding, break-ins, etc. Our reliable team comes prepared with trucks, tools, equipment, and the proper training to handle all your maintenance and construction needs in a professional, complete, and safe manner. Preventative maintenance is a top priority for Rezkom and the community associations we serve. Our pro-active preventative site inspections will help catch minor issues before they become major expenses. 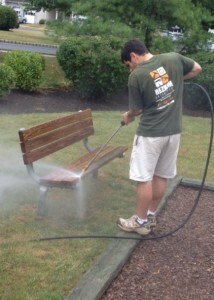 Regular upkeep prolongs the life of your buildings and improves your community’s curb appeal! Rezkom specializes in roof repair and replacement. Maintaining a sound roof for your building tops the list of crucial home repairs. Any damage or signs of needed maintenance should prompt immediate action. It is also important to keep water from seeping under the shingles and rotting the wood sheathing beneath. Ignoring a problem (even small ones) will accelerate the need to reroof and add to the overall costs. If your roof is more than 15-20 years old and most of the shingles are damaged or badly worn, it’s time to replace them. The Rezkom team will come and inspect the roof and will advise what should be the most efficient and cost-effective action. Brick, stone or cement exteriors, walkways, retaining walls, etc. Signs, tot lots, benches, etc. PAINTING: Rezkom offers full service painting and staining. Pressure Injecting or Polyurethane Injections is most often used to fix basement cracks with a foam rubber seal. This type of repair is most appropriate for concrete walls and slabs and underground parking garages. Rezkom specializes in this form of basement leak repair and waterproofing protection. Keeping your gutters and downspouts clean and maintained will keep them working like they should and allow the proper diversion of water. 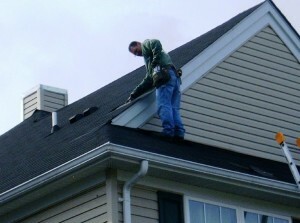 Rezkom understands the importance of gutter cleaning and maintenance and offers this important service. 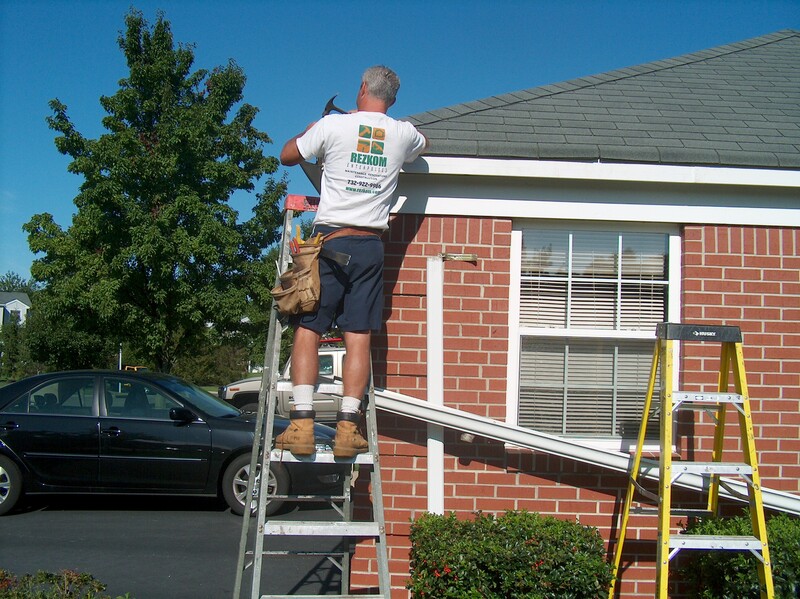 We can clean, maintain, fix, repair or replace any and all types of gutters and downspouts. We can incorporate spring and fall cleaning into an annual porter or maintenance contract! There are many reasons why you might experience roof or window leaks. Age, sloppy flashing, angled fascia, poor installations, missing sealant, pin holes and cracks can all make your windows susceptible to leaking. Over time as your building(s) become older, you need a professional to spot the leak and quickly repair it. Rezkom professional trained field mechanics can find, fix, repair or replace whatever is causing your windows or roof to leak. To have a service technician visit your property for an inspection of your leaky roof or windows, please contact us today. We offer experienced and professional counseling for all maintenance budgets. Let us help you save money with our tailored programs that work! We can meet with the board members and/or property management team to establish goals and budgets. We can provide insight and advice for developing an annual budget and work with you on an effective and efficient maintenance plan for your community. We can assist you in understanding, creating and enacting plans to maintain the beauty and integrity of your community.